It was the ‘Sitting is the new smoking’ buzz that first brought our attention towards office desk workout equipment. Hell, if no amount of gym time is going to replace the damage that sitting all day is going to do to your body, you take the workout to your desk. This amazing concept (AKA under desk elliptical) has changed the way people work these days. Standing desks are replacing conventional desks and there’s even a treadmill desk. After having reviewed a couple of those, which we found to be overpriced and overhyped, we decided to review an under-desk elliptical trainer instead. At first, it seemed too farfetched a concept to even be true. How could you put an elliptical trainer under your desk? Well, here’s the Jfit Under Desk & Stand Up Mini Elliptical trainer review for you from EllipticalHub. This dainty little patent-pending under-desk elliptical machine weighs less than 25 lbs, allows you to exercise while you are sitting or standing and also lets you choose the number of calories that you wish to burn. How about that? Even though the name suggests mini elliptical, the Jfit is more of a desk cycling device without the arm bars of a full sized elliptical. It is approximately 25 x 20 inches in length and width and can easily be accommodated under any standard sized desk. It has two large sized foot pedals which can be adjusted according to your position while exercising. You may choose to pedal the unit while sitting or while standing. The Jfit is the only under desk elliptical machine that has this feature in the market currently. The adjustable angles also prevent the knee cap from hitting the underside of the desk which is a common problem with most desk cycling devices. There is a tension dial that can be used to increase the tension by up to three levels, a digital monitor that displays the functions that you wish to track (time, distance, calories and speed), two wheels and a carrying handle that makes transportation effortless. Also, there is a handle that can be used to lock the machine around one leg of the chair which prevents it or the chair from wobbling while you are exercising. Alternatively, you can just place it on a rug or a carpeted surface and the Jfit mini elliptical stays rock steady. The pedal is approximately 12 inches at the highest position. So, ensure that you are aware of the clearance needed for using this under your desk. The design is simplistic but very effective. 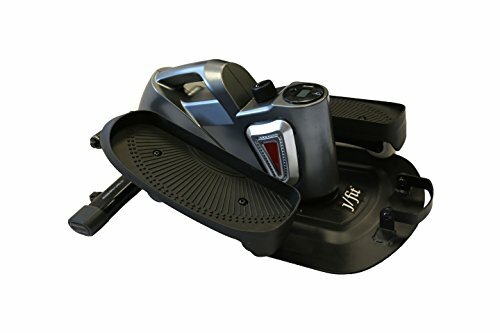 The Jfit Under Desk and Stand Up Mini Elliptical has a 10-15 inch stride which is just about perfect for men and women of all sizes. Even if you have long legs, you can make consistent short strides with the machine which will be just as effective at the end of the day. Ok, it may not be as effective as a full sized machine maybe. But that’s not what its intended to do. It is intended to keep you active while you work. And it is just perfect for it. Keep the foot pedal at its lowest position and you can paddle it standing up. The middle position and the top position are designed for use while you are sitting. Notch up the tension to the highest level and you will be surprised at how challenging it can be. The best part is that you can reduce the tension easily with the turn of a knob. Even if you are at home or are travelling, there is one less reason to interrupt your workout routine. There are so many possible ways in which you can use the Jfit under desk elliptical machine for a good mid-work full body workout. Pedaling in the seated position lets you target your calves and hamstring muscles while standing up involves all the muscles of the legs and also makes it akin to a light cardio workout. If you are looking for something more challenging, you can always add weights in the form of weighted vests or wrist weights and perform synergistic movements that involve all the muscle groups in the body. The stride is not adjustable. If you are above 6 feet in height, you may find the smaller strides a tad uncomfortable, especially for the first few days that you use the machine. Verdict: For $150, the Jfit Under Desk Elliptical gives you the opportunity to convert those lazy work hours into something more productive and healthier for your body. And by tracking your activity, you take the guesswork out of it. We’d say this deserves to be under every desk around the world. Completely worth the price.